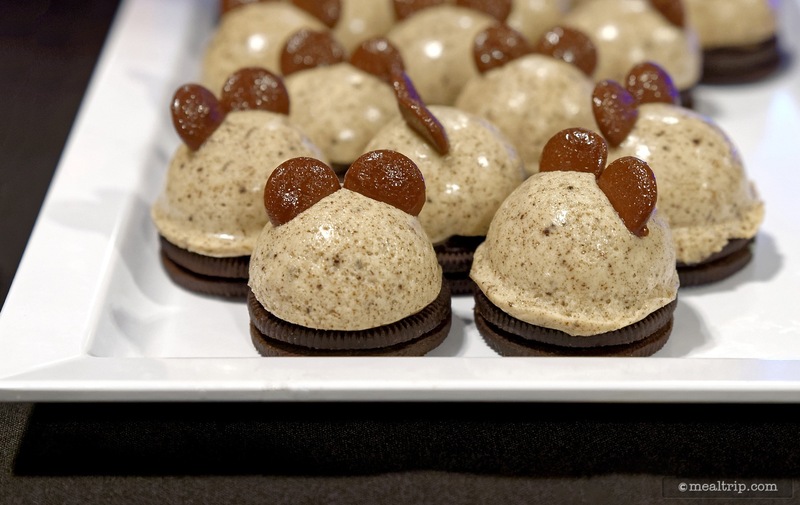 The Happy HalloWishes Dessert Party Premium Package listing is a Special Event dining location at Magic Kingdom featuring Dessert Party cuisine. 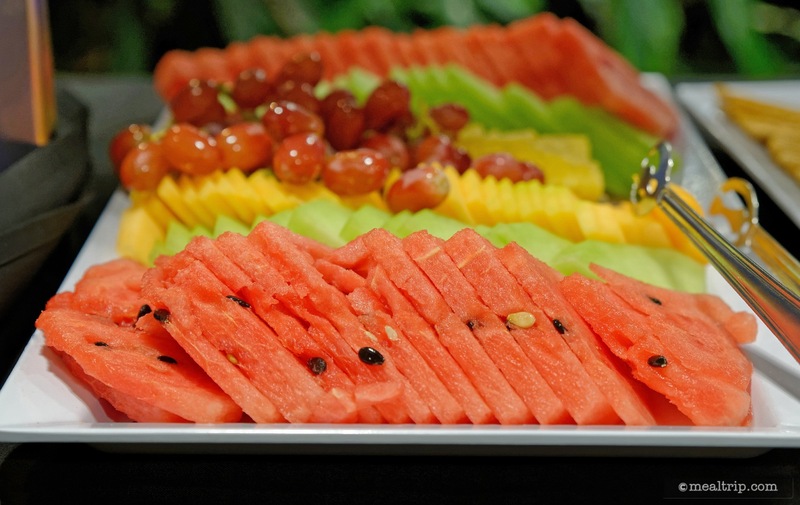 There are 44 photos in the Mealtrip photo gallery for this location and dining period. 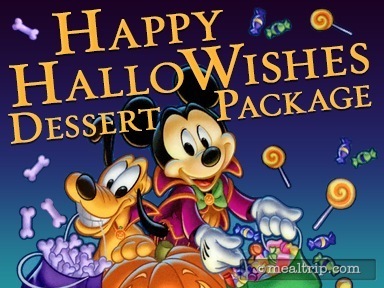 The Happy HalloWishes Dessert Party Premium Package listing currently has a score of 71 out of 100. 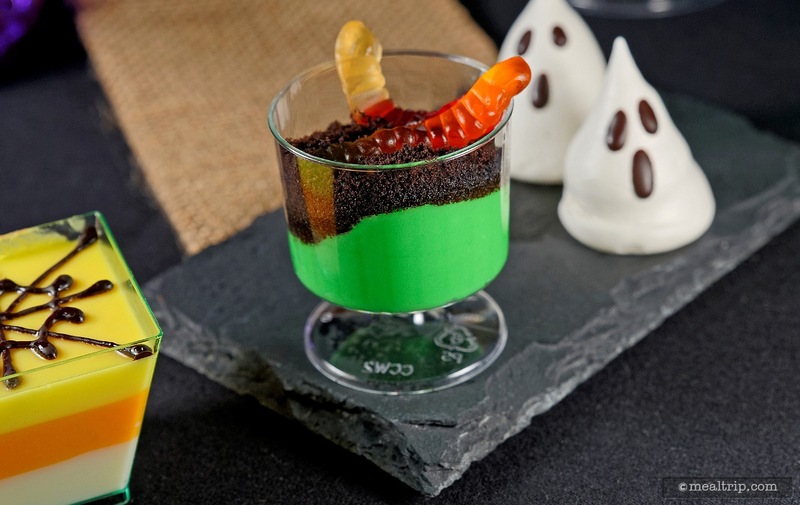 Click here to read all of the reviews for this location, or log in to Mealtrip.com to add your own review for Happy HalloWishes Dessert Party Premium Package. 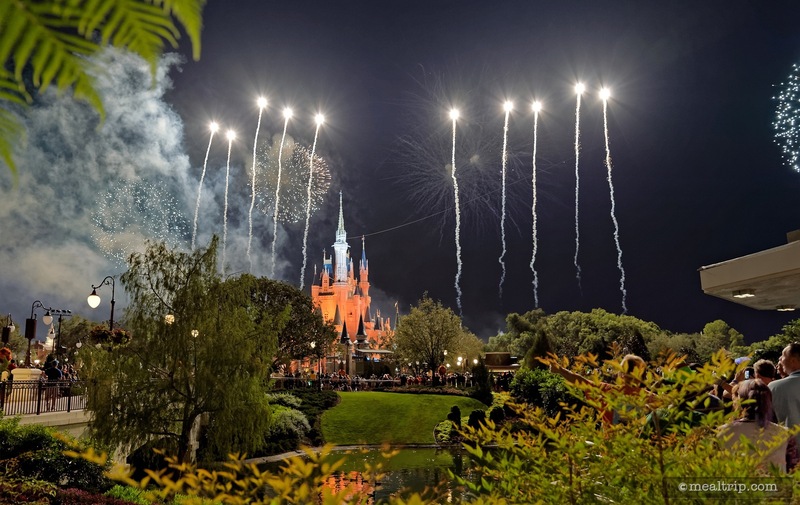 The HappyHallowishes credentials are printed on a thick laminated card and are attached to a lanyard. 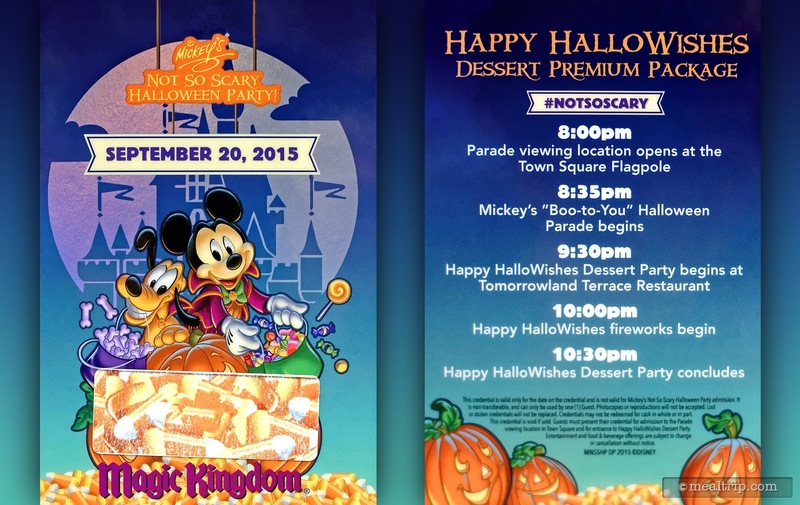 The back shows a schedule of the Premium Package events, and the front shows the date and has a group number printed in the candy corn area (which has been removed in this photo). 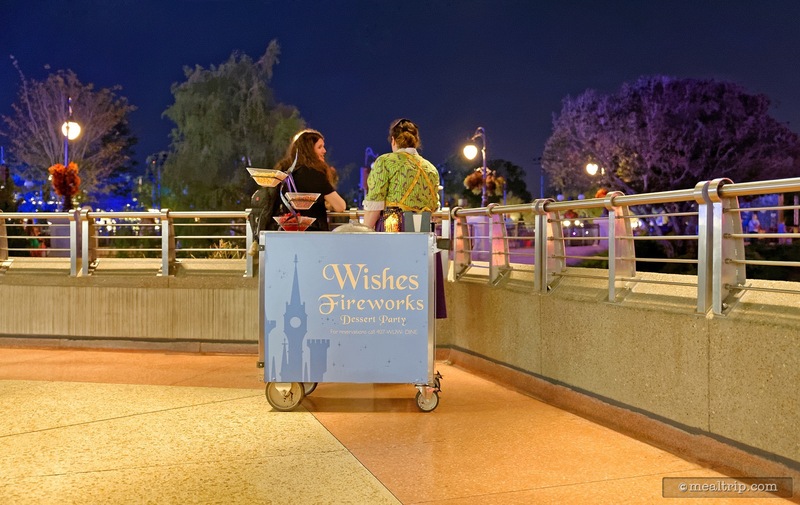 The HalloWishes Premium Package Parade Check-In area is located in the Main Street hub, across from Tony's. Bottles of ice water (behind the check-in podium) are free for Premium Package guests. 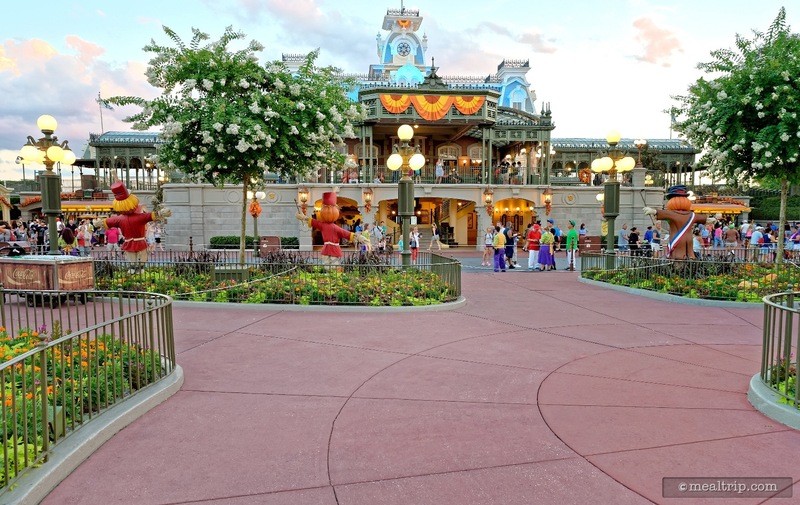 About 80% of the Main Street hub area is used for the HalloWishes Premium Package guests. 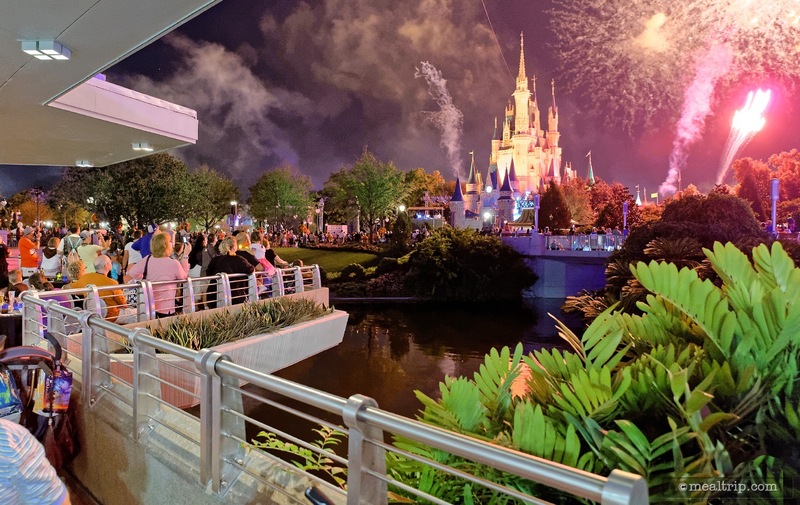 Looking back at Tony's from the far end of the HalloWishes Premium Package viewing area. 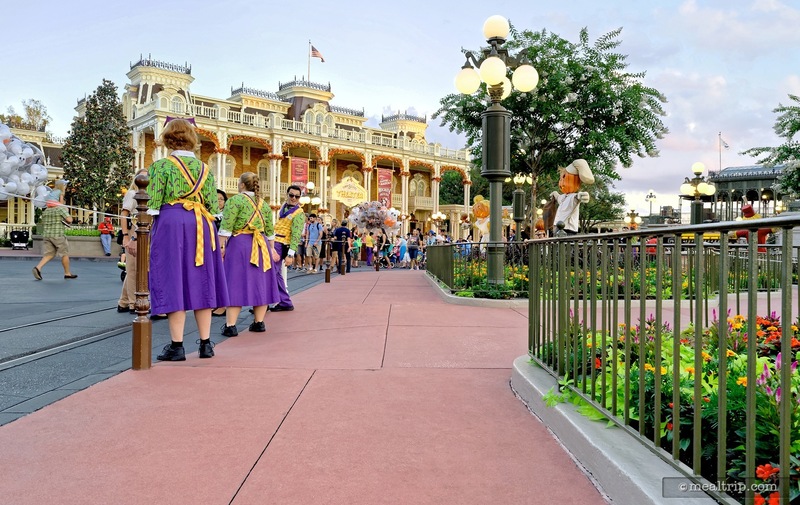 The Happy HalloWishes Premium Package parade viewing area wraps around most of the Main Street hub, including the space facing the train station... assuring that all package guests get a curb-side view of the parade. 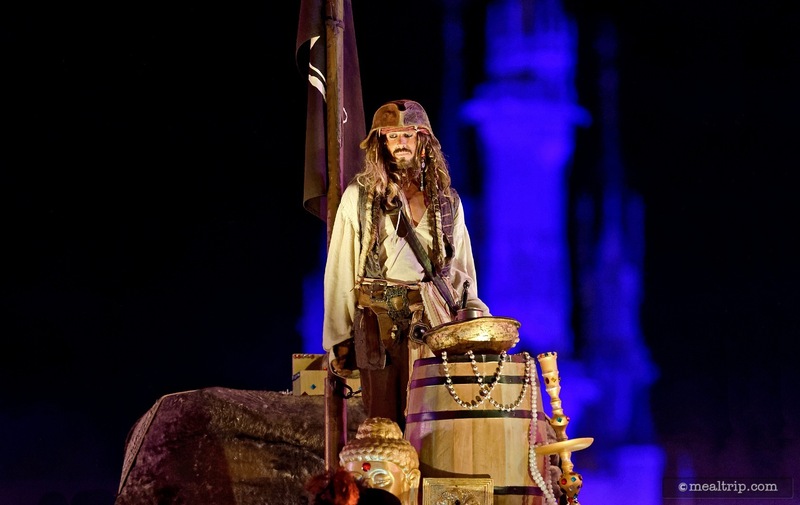 It's lonely at the top, even for Jack Sparrow. 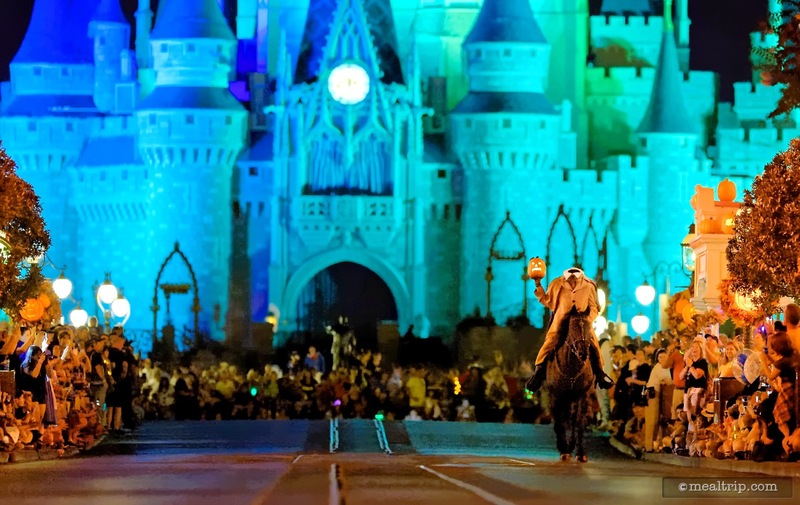 No worries though, he's got the best view of the Boo To You Parade at MNSSHP. 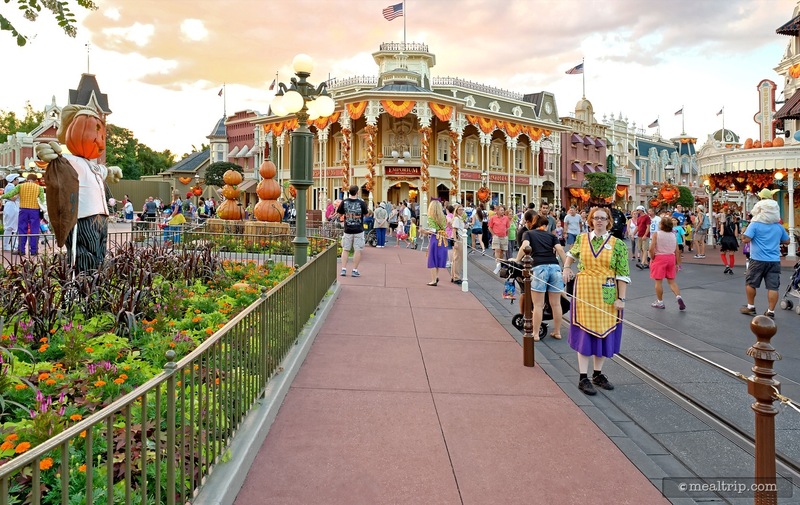 Everyone in the Happy HalloWishes Premium Package gets a curb-side view of Mickey's Boo-To-You Parade. 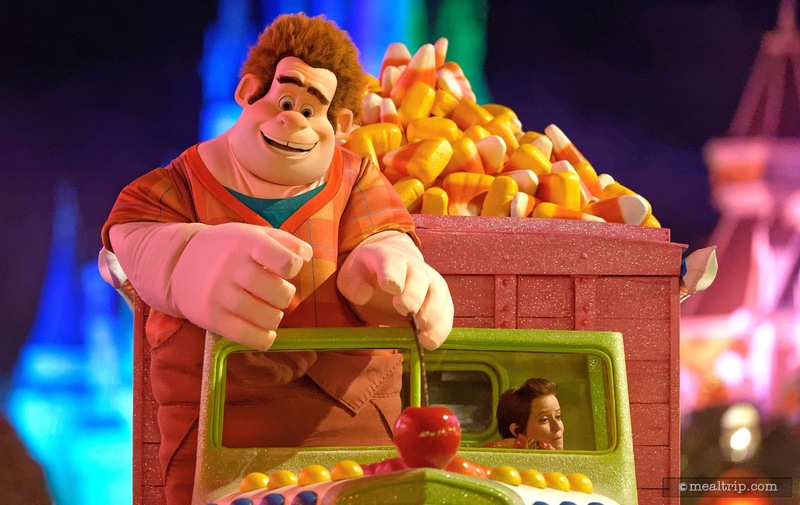 Wreck It Ralph and the bouncy candy corn car make their way down Main Street. 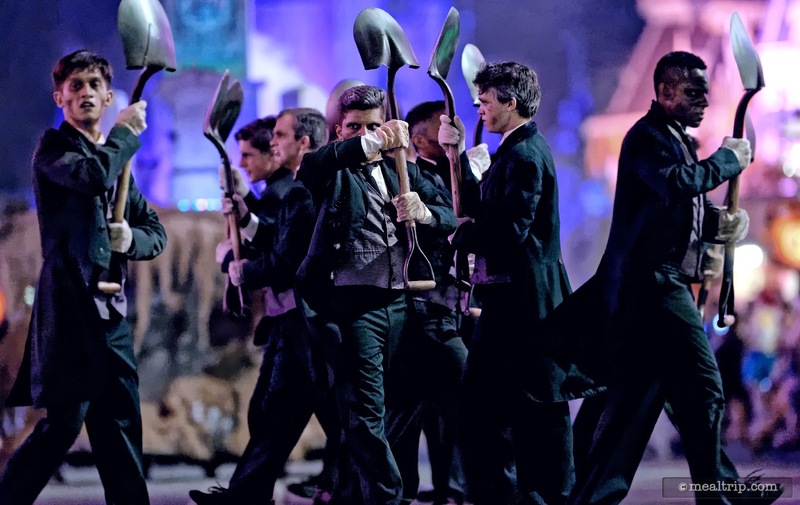 These guys follow the horses... no, no, it's the sparktacular Grave Digger troupe. 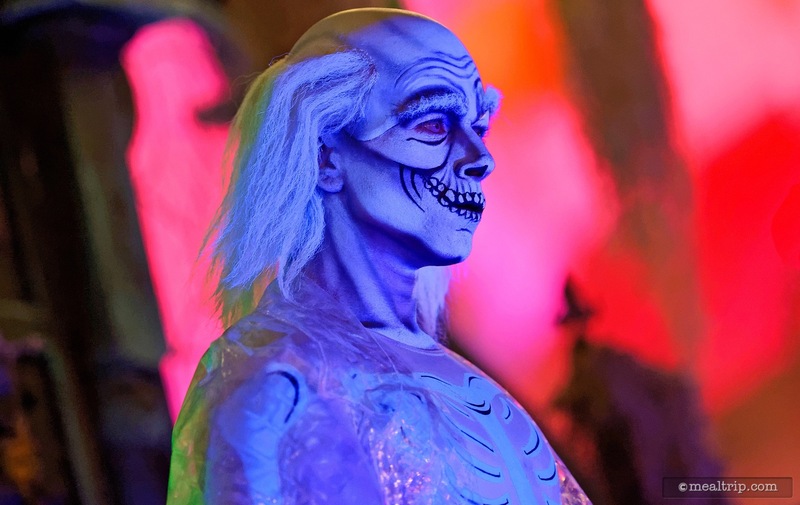 One of the three Grim Grinning Ghosts joins in the Boo To You Parade during Mickey's Not So Scary Halloween Party. 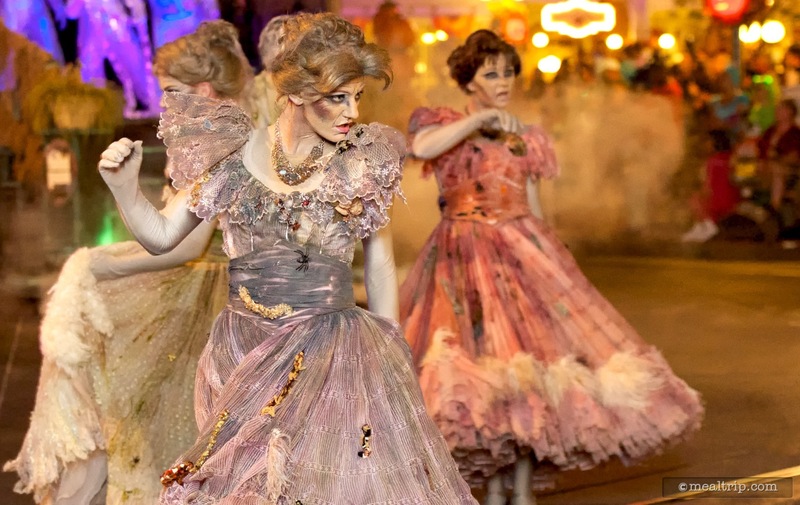 Who says Mickey's Boo To You Parade isn't scary? 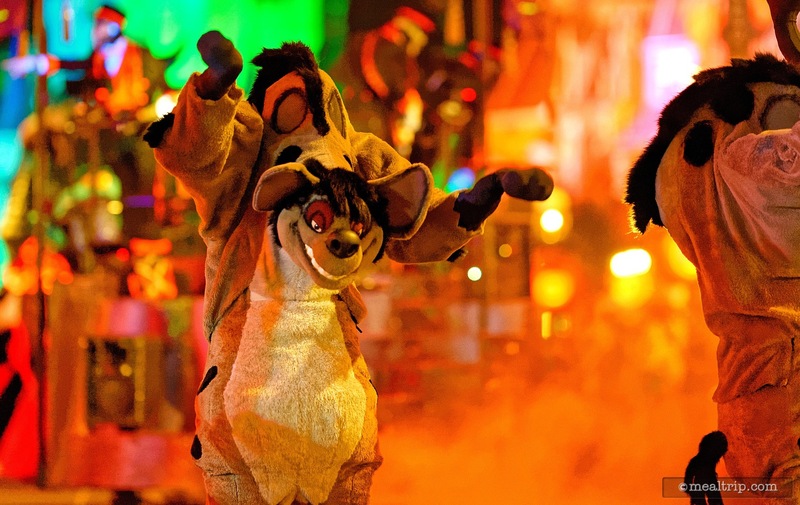 I wouldn't want to tangle with one of these Hyenas. 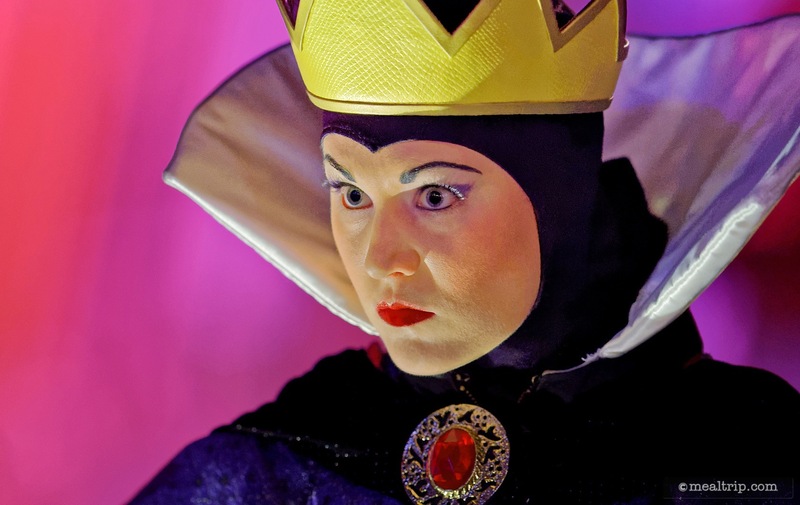 The Evil Queen from Snow White is looking pretty good after 30 minutes in 90 degree weather wearing all of that! Could that actually be Angelina Jolie in there? 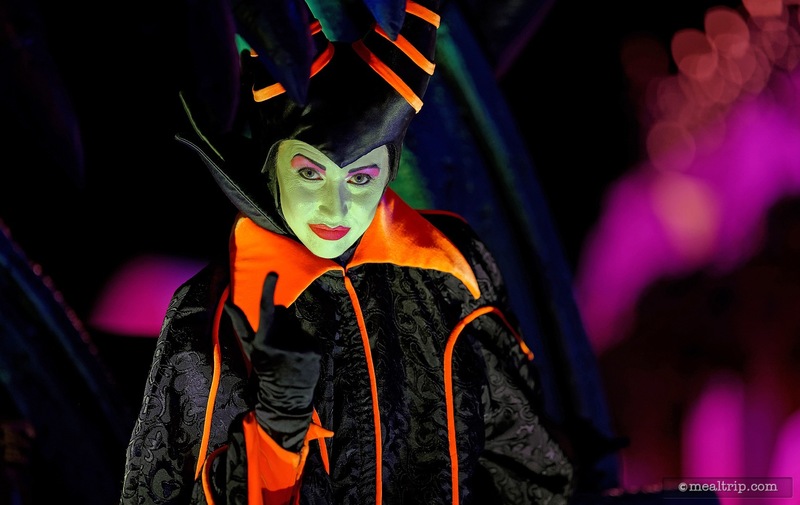 The pretty spectacular Maleficent rounds out the Boo To You Parade at MNSSHP and our time in the Happy HalloWishes Premium Package parade viewing area. 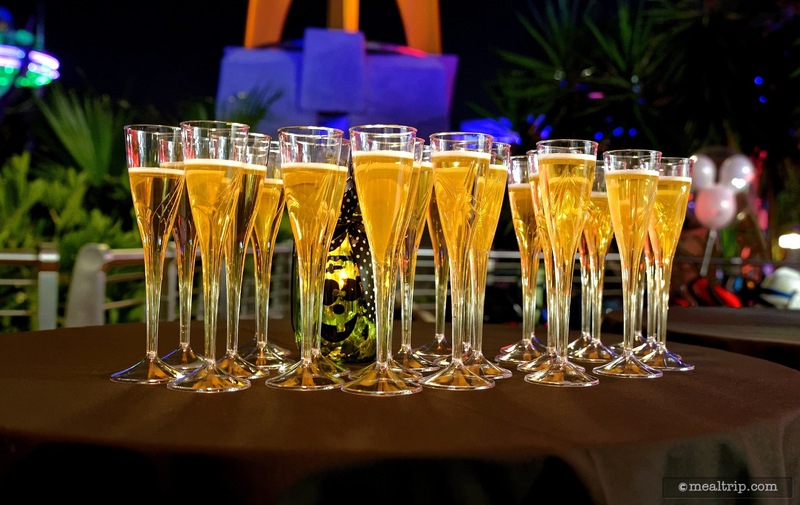 Everyone gets to pick out their own flute of sparkling apple cider before entering the Happy HalloWishes Dessert Party area. 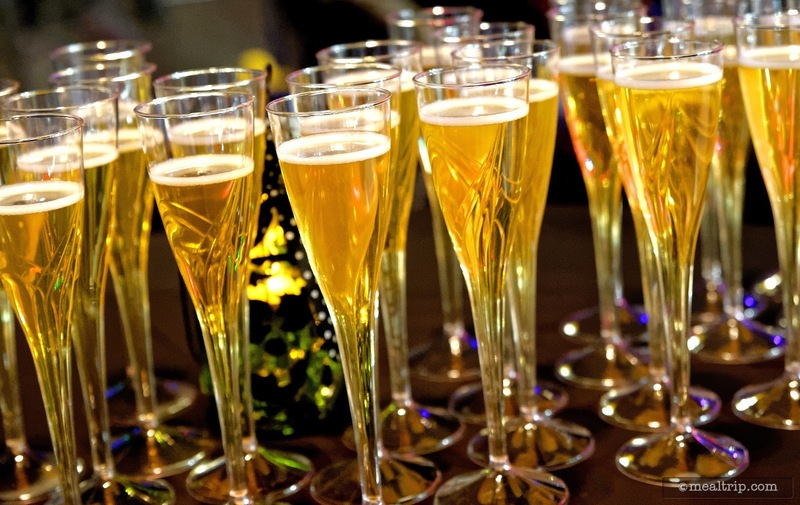 There are a couple different tables set up with apple cider to avoid any congestion at the entrance to the event. 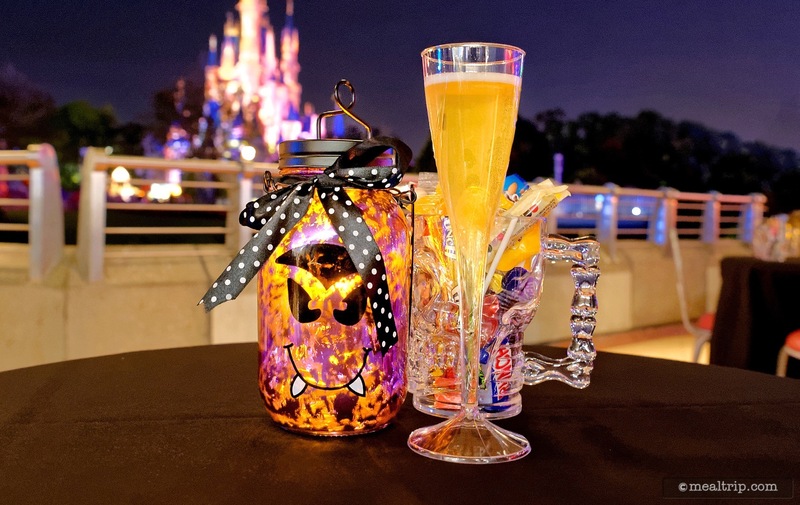 Here's a close up shot of the lantern, a flute of sparkling cider, and your very own skull cup full of candy. 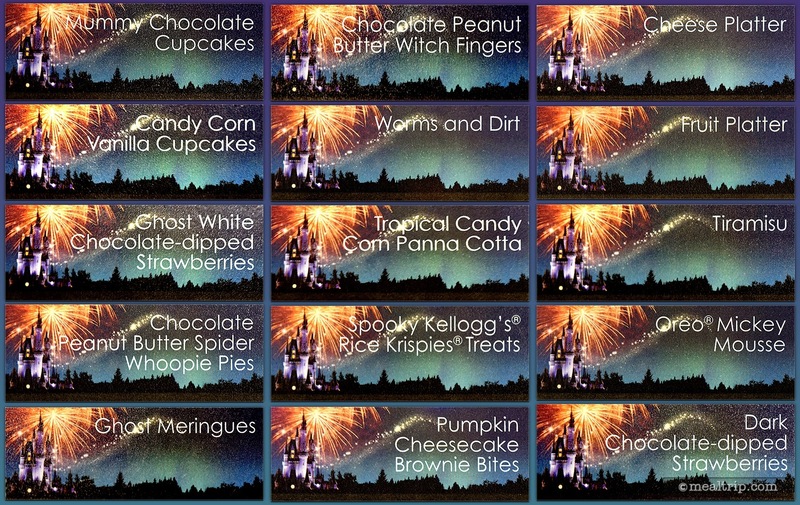 Most of the dessert title cards from the Happy HalloWishes Dessert Party. 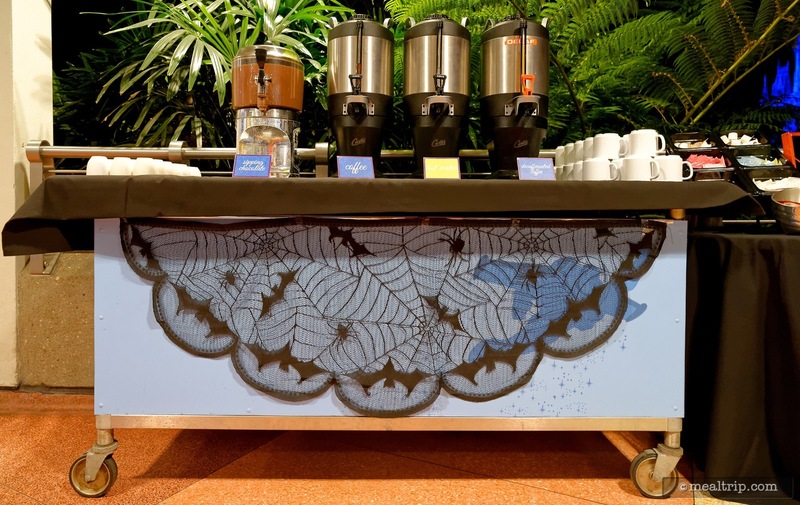 The hot beverage station at the Happy HalloWishes Dessert Party has been decorated with a bat net! 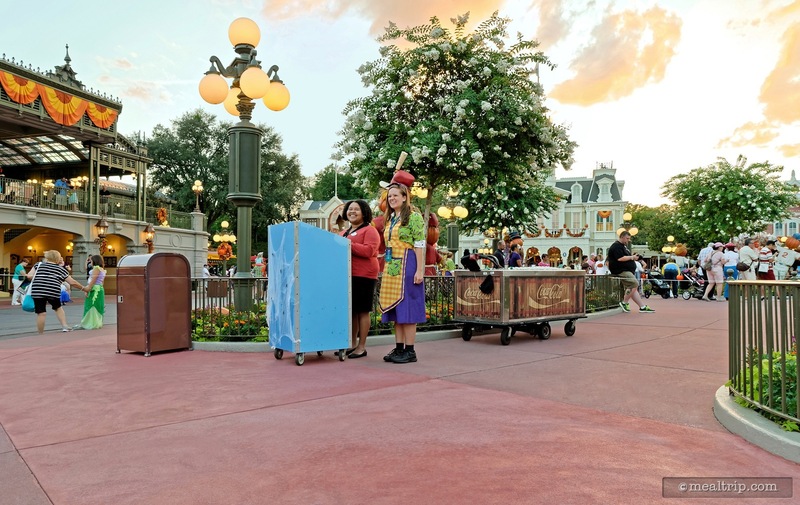 The mobile ice cream cart is also part of the "normal" Wishes Dessert Party. 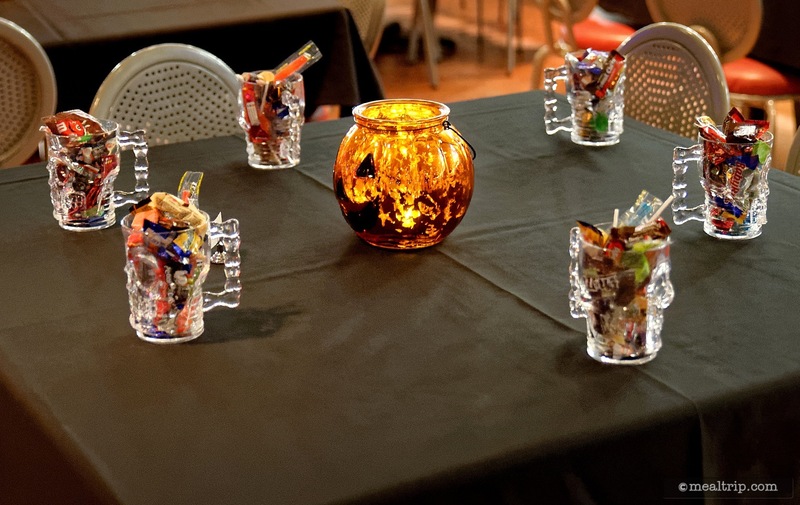 At this special Halloween event, they had candy corn toppings, sprinkles and cherries for your sundae. 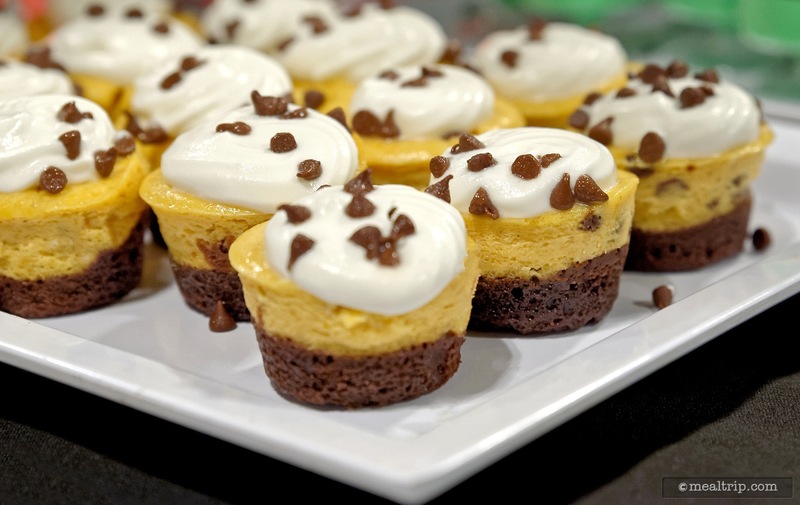 Pumpkin Cheesecake Brownie Bites from the Happy HalloWishes Dessert Party. 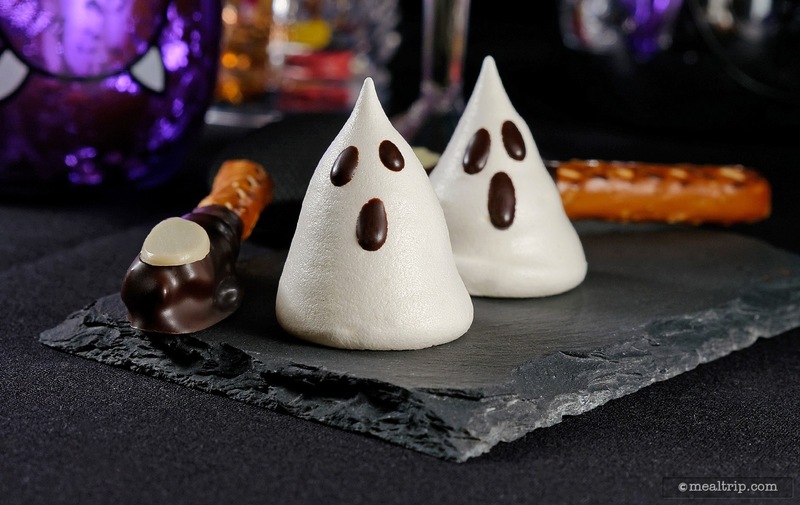 Ghost Meringues and Chocolate Peanut Butter Witch Fingers from the Happy HalloWishes Dessert Party during Mickey's Not So Scary Halloween Party. 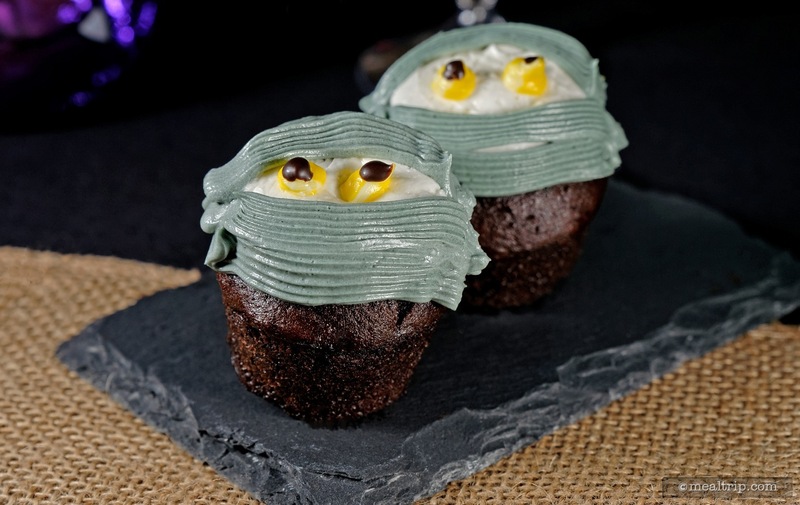 Mummy Chocolate Cupcakes are looking at you! 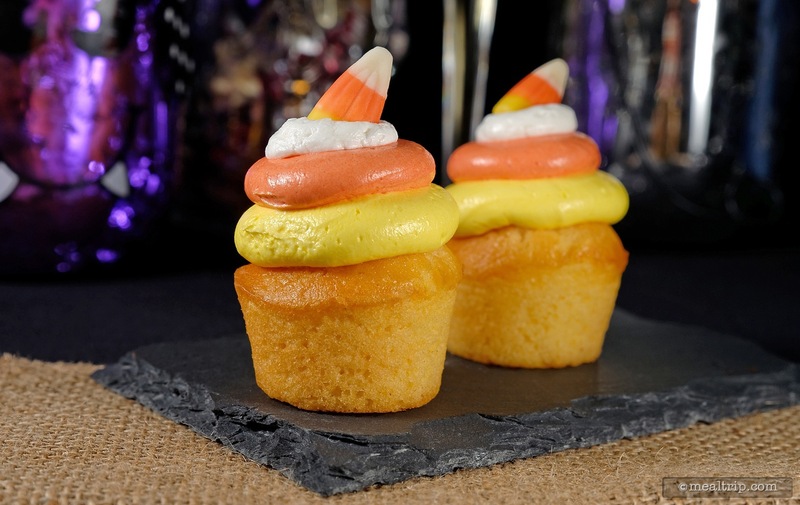 Some creative piping skills make these Candy Corn Vanilla Cupcakes look as good and they taste! 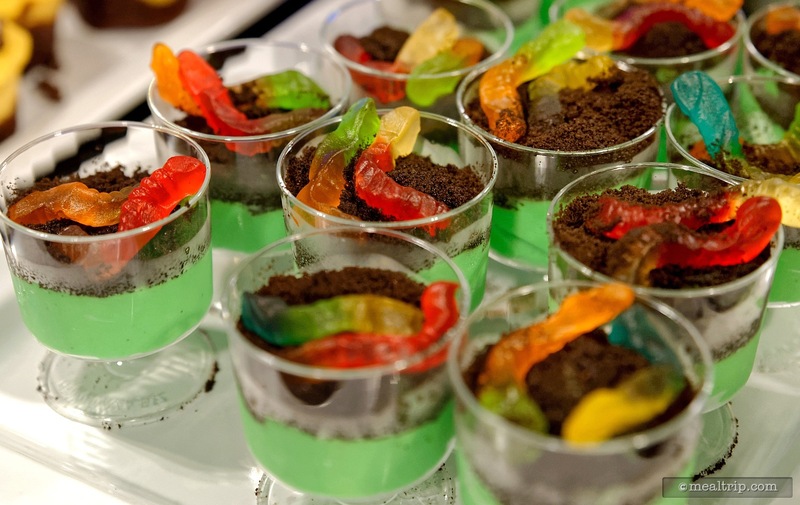 Dirt and Worms, is not my favorite dessert, but it sure is pretty! 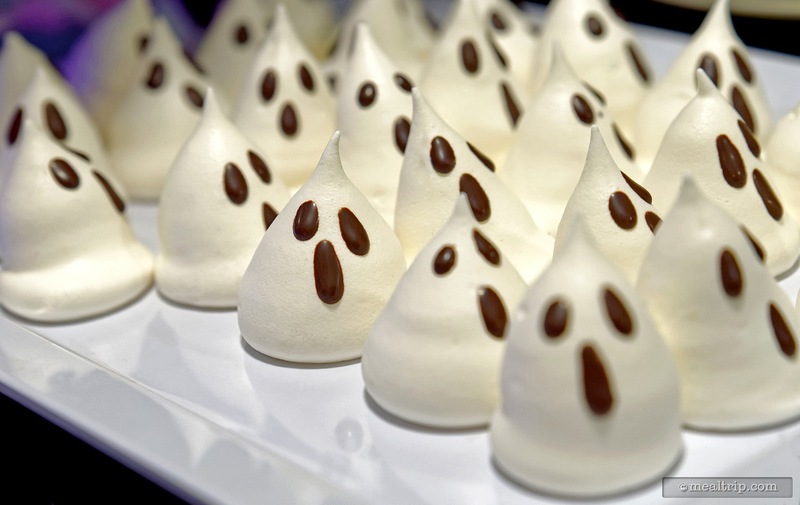 The Meringue Ghosts are a bit frightened by the worms. 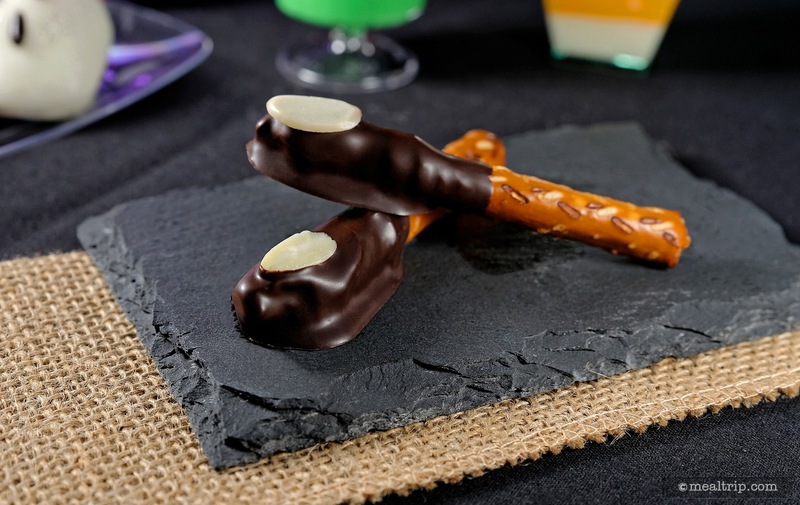 The Chocolate Peanut Butter Witch Fingers are quite good... if you like peanut butter. 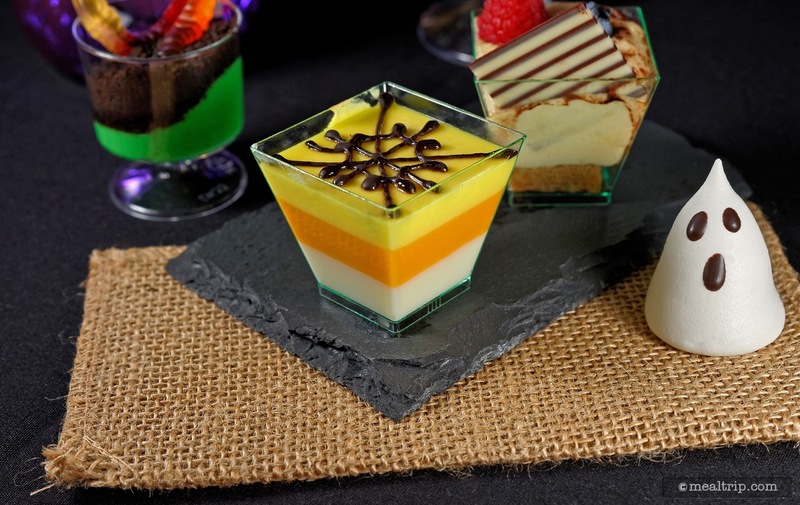 The Tropical Candy Corn Panna Cotta had a welcome mango punch to it... 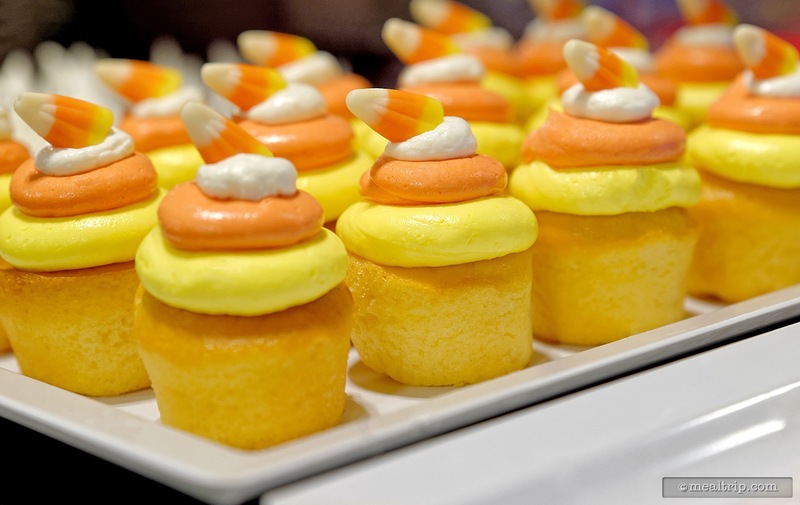 I'm just not sure it's a "fall/autumn" flavor. 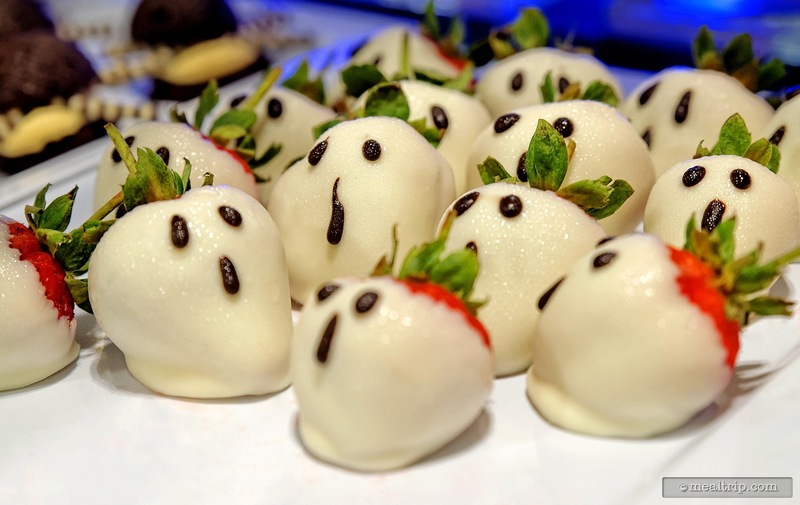 Great dessert... wrong time of the year. 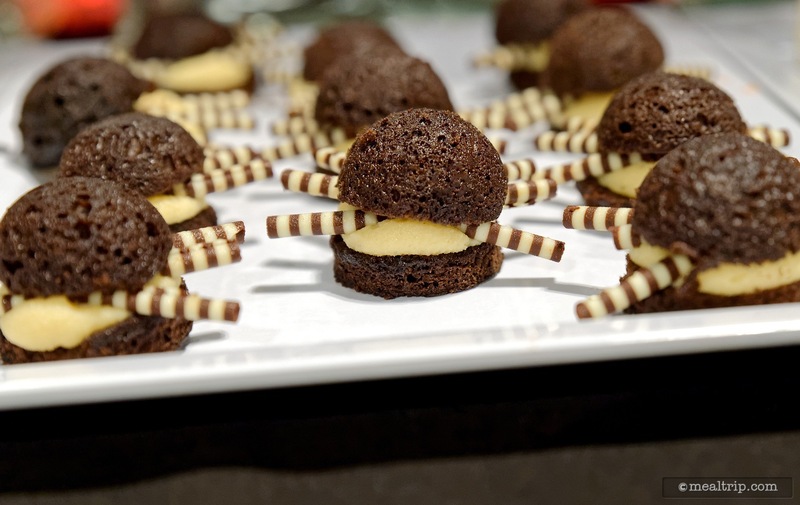 How much time went into making these Chocolate Peanut Butter Spider Whoopie Pies? 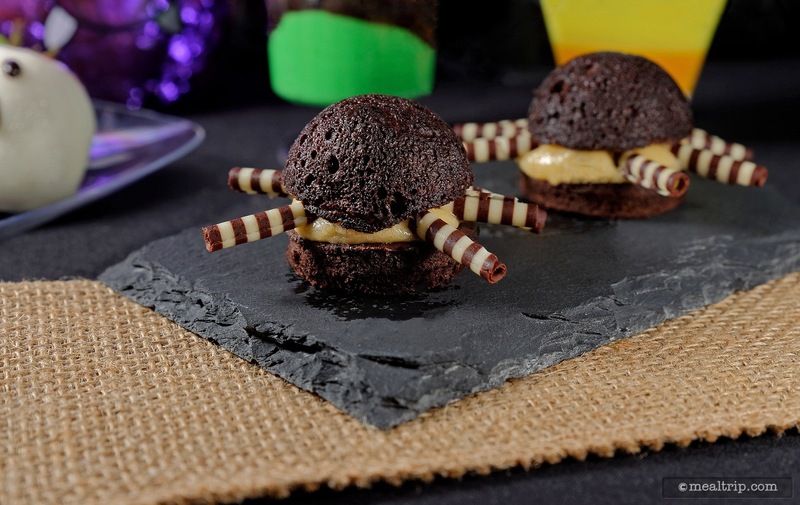 Those legs are chocolate tubes that are shaved off a block of chocolate by hand, and placed in the sides of the peanut butter cream. 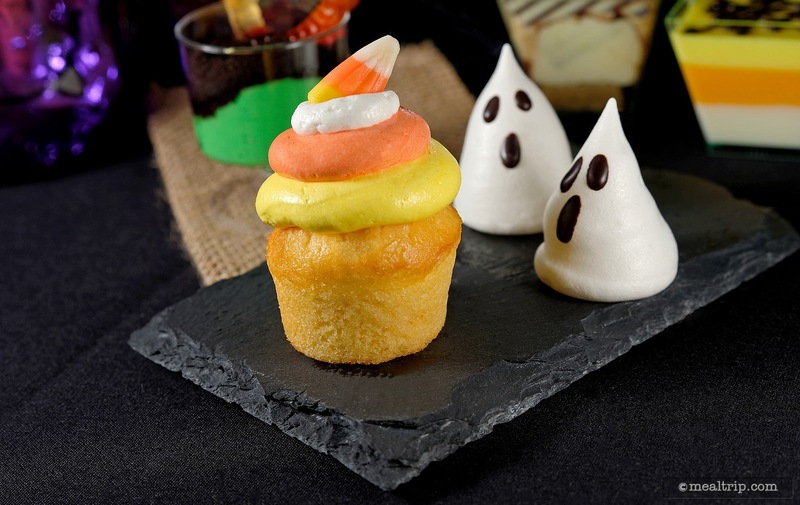 The Ghost Meringues are trying to figure out how to eat the Candy Corn Vanilla Cupcake! Oh no!!! 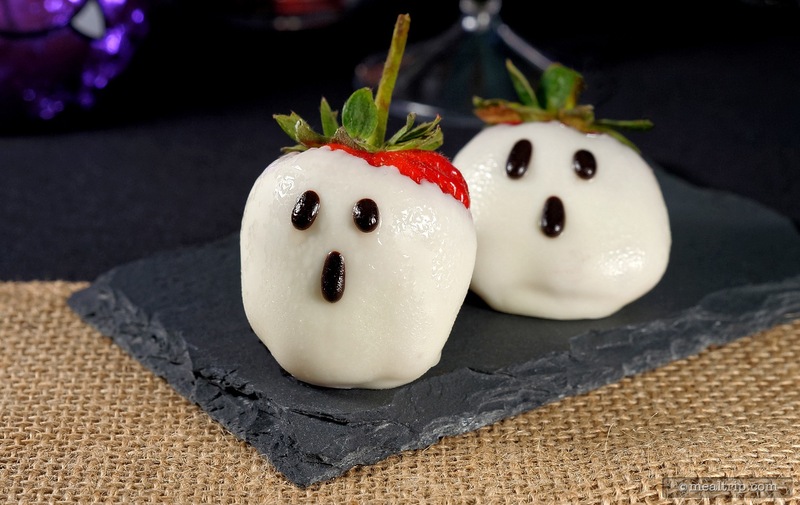 The Ghost-dipped White Chocolate Strawberries are not related to Mr. Bill. This photo shows the main patio area at the party. Some guests choose to stand at the railing, while others seem fine with staying seated. It just depends on where your table is located. 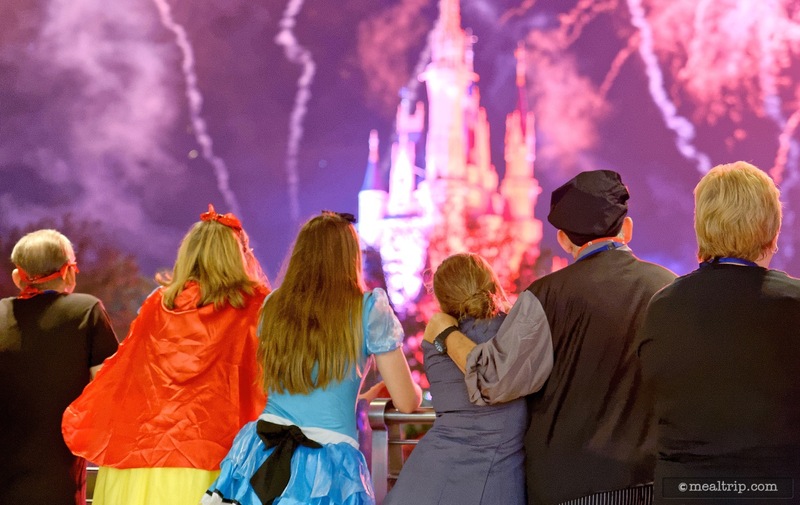 Halloween clad guests enjoy the HalloWishes fireworks display from the Happy HalloWishes Dessert Party. 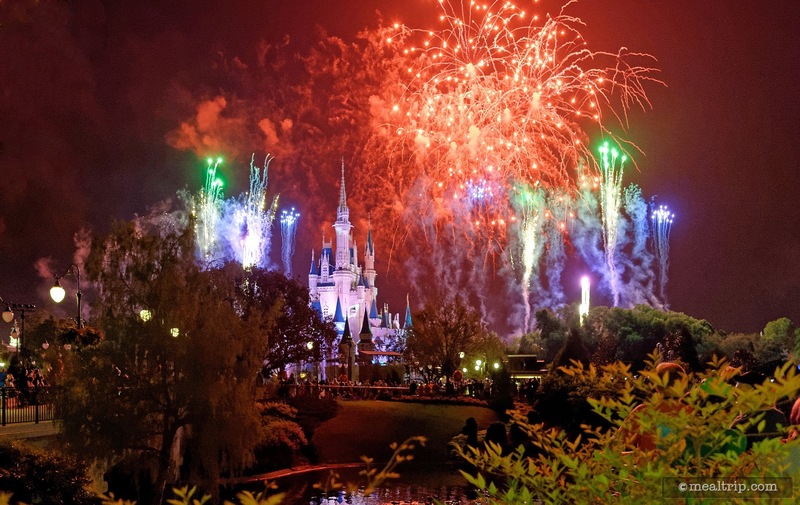 The main fireworks do not appear directly behind the castle from the dessert party location. It's a great view... it's just not centered. 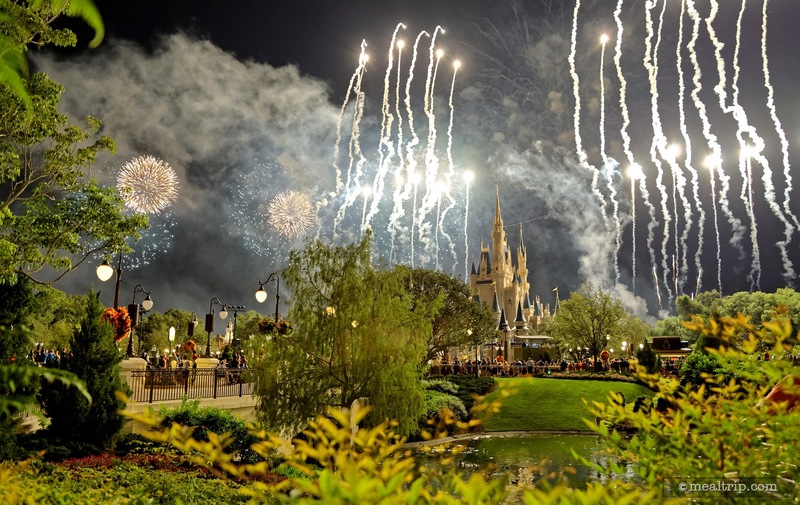 Guests "in the know" have asked how well you can see the perimeter fireworks from this location. Honestly, you can usually see one side, or the other, but not the full perimeter. Most of the left-side perimeter fireworks are visible from this vantage point. 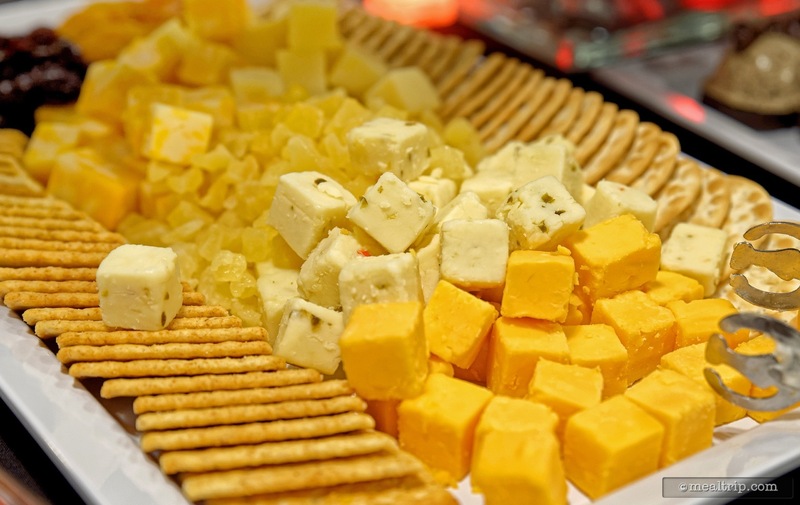 The right side would be blocked by the location's overhang. It's still a pretty cool view though.